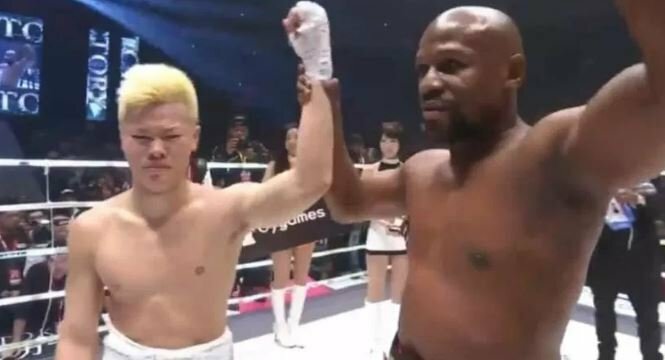 20 year old Tenshin got stopped in the very first round of today’s three round exhibition under boxing rules with Floyd Mayweather but he can hold his head held high really. His corner threw in the towel so he didn’t get knocked out cold. Rather, he was on his feet at the time of the stoppage so he can definitely come again without the fear in the back of his mind of having been knocked out viciously — which can often then make a fighter gun shy in future fights. He also pocketed a substantial pay day and had his name put out there around the world because of his association with someone like Mayweather. “It was a challenge to fight with (Mayweather) — I was reckless. Although the result was getting knocked down I do not regret (taking the fight). I did not beat Mayweather at my age of 20 but I came with courage to the fight. Thank you very much Floyd Mayweather (and his team). Thank you very much for everyone who supported me. I could not fulfil your thoughts (wishes for me to win) but I will continue to challenge myself moving forward. No doubt he will be back to his usual sports of kick boxing and mixed martial arts in the new year. As for Mayweather — don’t be surprised if he picks up another one of these easy pay day boxing matches in the new year. It was meant to be a boxing exhibition but turned out to be a one way beat down in favor of Mayweather in the end.